It’s been awhile since I last posted something up, traveling-related, yikes! I haven’t done any traveling after my Palawan and Siargao escapades – which I haven’t blogged yet due to laziness 😭. I’m very sorry for procrastinating about this for so long! I’m not a seasoned traveler yet. In fact, I got bitten by the travel bug back in 2015. 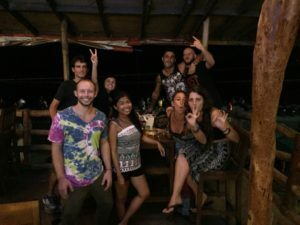 My biggest influences were my Couchsurfer friends, so thanks to them, I decided to do a bit of traveling alone… and I loved it! 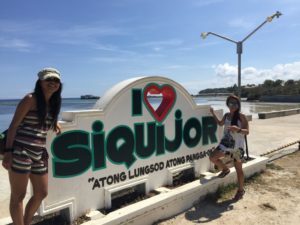 Circa 2016: me and my CS friend, Kaye, in Siquijor!!! I also get questions from people on how I can afford my travels. Most people close to me think that I am well-off or made more money to venture off to the unknown. The answer is simple: I work and save up. Like you folks, I have a job (I recently switched jobs because my previous company folded) that helps me pay my bills, pay my rent, buy my food and so on. I work hard like everyone else. 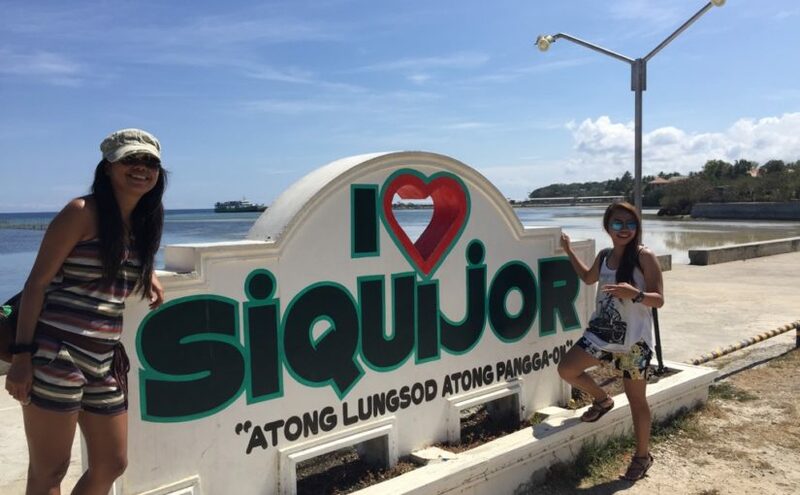 I do budget my expenses since I live in Panglao Island. I’m not in the comforts of my “home” – the city life that I was accustomed to. I’m unable to seek help from my parents or my siblings anytime. I knew that some travelers juggled two to three clients to sustain their travels. That may be hard but that’s how they hustle. And I admire their dedication for it. I could have done the same – live a nomadic life and work with three clients at the same time. I chose not to and simply travel once a year. But I’m not closing that doors yet because I plan to pursue the nomadic life in the future. 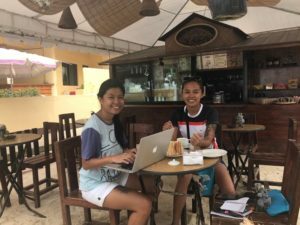 Working in a cafe in Panglao with my friend, Lux! Years ago, I juggled two jobs at the same time and I ended up being unhealthy. Worse, unhappy. Did I earn a lot? Sure, but it was physically and mentally exhausting for me. Because I was earning well, I was spending way more that I should. Shopping became my retail therapy at one point – going from one shop to another to try on another dress, another shoe, or a new bag. Since then, I only have one job that can sustain my needs, plus save up for travels. Now I’m in my 30’s, I started to declutter some stuff – well not entirely. Most of the stuff I accumulated over the years are now in my parents’ place. They’re currently using some of my furniture. As for the clothes, my 10-year old niece (she’s growing up so beautifully by the way) now owned and wore majority of them. I also gained a bit of a weight, so I resorted to use the ones that still fit me while the rest are stored away in boxes. So where am I going at with this? Well, it feels good to own a bit less. I didn’t have to worry about upgrading to a new TV set or fix a broken door or buy new furniture. For now, I am currently paying for an apartment that is currently building at the moment and I will have to furnish it once it’s done. It’s a good investment and I’ll have to use it at some point by renting it out through AirBnB or something similar. Or maybe I simply retire there and own a dog. Who knows? I admit that I’m still new with traveling. I have read other travel blogs, watched Youtube hacks, subscribed to airline email alerts, and so on, so it’s still a learning curve for me. Aside from saving money for airline tickets, allowance, and travel insurance, I also have to worry about the immigration issues and how to properly deal with them (seriously guys, PH immigration is no joke and it’s best to Google them why). Still, it’s fulfilling for me. I get to learn new things as I go and learn more about myself and what I’m capable of. I promised to travel once a year because when I’m older, I’m unable to do it anymore and it’s too late for regrets. Anyway, I would like to let you all know that I’m still here and I do apologize for the very, very long hiatus. It has been tough for me lately, especially the last few months. Still, I try to stay positive and be thankful for what I have now. Lastly, I’ll keep you guys in a loop on my next travel plans for this year, yay! And please don’t worry, I will focus more and write those long-overdue travel posts (Palawan and Siargao) very soon. Please, bear with me! If there’s anything you want me blog next or a question about my travels, please let me know in the comments section and I’ll be happy to answer them. Wherever you are, happy travels!